There have been a lot of movement towards taking music back to the roots of the human voice. Making the first instrument the focal point of the recording or at least a major foundation of it's structure. Animal Collective, Panda Bear or even Ariel Pink don't feel like they're known for their innovative electronic directions as much as their unconventional vocals, using them as more than just a device for the melody and meaning. 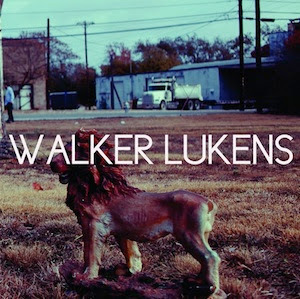 Walker Lukens seems to be playing with the rhythmic aspects of the human voice in a similar way alongside his clear, wavering soul vocal and electronics. A-Side "Kindle to your Fire (Oprah Voice)" - Is there some kind of Amazon tablet connection here? A weird coincidence but this obviously makes more sense as a metaphor of being consumed by that other person. The track opens with Walker's vocal sounds, out the background comes a mass of vocalizations coming together in a haze of melody. That many layers of vocal in spits and bursts is inherently impressive, aside from the recording process. You're made aware of that heavily layered process, but it doesn't feel any less impressive. Walker's vocal is super strong coming in right over that chaotic rhythm, definitely feeling like one of those born singer/songwriters. The main instrumentation is made up of odd polyrhythms, handclaps and a multitude of human voices punching in and out. When the chorus comes back with that repeated title lyric it's an impressive piece of dense dancy electronics with his alter egos of backup vocals growing and growing almost overtaking the main lyric. It's a two minute flare up, a fireball burst of energy that started with nothing but a tiny spark. B-Side's "Casa De Davide E Chiara" starts with a heavy alternating low thump and high pitch smack along with a click metronome, ever so slowly getting faster and faster. It's a monotonous machine pounding away over a delicate piano line playing along it's own separate path behind Walker's forward vocal, making the most of this silence. Strange almost reverse cymbals and creaking effects build up along with his impassioned style. A lone violin and bass line take this quicker horse trot rhythm from darkness into the light. Something like Jens Lekman in a more abstract direction vocally, but exploring those unique directions that have to come out of abandoning all references and creating for yourself. Get this from Walker direct on his website.